Let’s put together the “Happy Hands” meme! A meme is a quick and easy way to generate an MMD animation and video. They are a great way to show off your latest models, too! A meme is like a kit that you open and assemble in MikuMikuDance. It will have a motion file and a WAV music file. It may also have a camera motion file … and, as in “Happy Hands”, it may contain a background image. Once I decided to create my version of the “Happy Hands” meme, I searched YouTube for mmd happy hands link and then searched through the results until I found a link I could use. The link for the meme is no longer valid. It used to be this one:http://www.angelfire.com/sinlessrogue/Motion_files.html — but that link is no longer online. 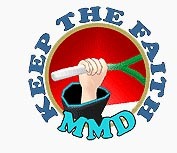 LearnMMD.com now hosts the meme from our Downloads page. Download the Happy Hands Meme.ZIP file and put it on your Desktop. Double click the zipped folder to open it … and see the Happy Hands Meme folder. Then select the command EXTRACT ALL … and follow the defaults to find the new Happy Hands Meme folder on your Desktop. You can discard the original Zipped folder if you wish. 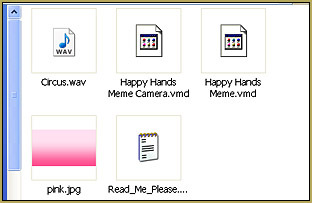 Look inside the Happy Hands Meme folder and you will see FIVE files: the WAV music file, 2 .VMD motion files, a ReadME, and a background image: “Pink”. I moved that new Happy Hands Meme folder into my Users folder inside MMD’s main folder. Leave those files together, in their folder. You might be tempted to put the WAV file into your WAV folder and then move the two VMD motion files into your Motions folder … but doing so may just confuse you later. Leaving everything together in one folder keeps things tidy. We are ready to start MikuMikuDance! When the program opens, you have a blank stage screen. See that “Camera/Light/Accessory” is already selected in the Model Manipulation menu box. Go ahead and select LOAD MOTION DATA form the FILE Menu … navigate to your Happy Hands Meme folder and select the Camera.vmd motion file. Now, load a dance model. I chose Meiko Sakine because she has no sleeves to get in the way … and because she is one of the original Kio characters included in the basic MMD download. 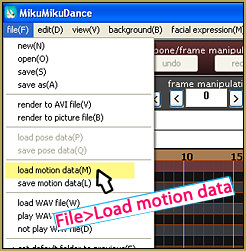 Once she is loaded, go to the File menu and LOAD MOTION DATA and select the other VMD motion file. You can push PLAY and watch the action! Next, load the WAV file by choosing LOAD WAV FILE under the FILE Menu. Again, navigate your way to the Happy Hands meme folder and select the Circus.wav file. Push PLAY and see what you have created! Finally, load the PINK background image by choosing LOAD BACKGROUND PICTURE FILE under the Background Menu. Under the VIEW menu, turn off the Display Coordinate Axis to clear your grid lines from the screen. You can resize that background image by holding down the Control key while you drag on the Magnifying Glass icon in the upper right of your screen. Push PLAY and watch this nice little animation. That’s it! … It is that easy! NOTE that the windows beneath the PLAY button are empty. MMD does not know how many frames are in the video. You cannot save the dance as a video until you identify the number of frames. A quick check of the model and camera frames told me the action ended at about frame 355. When I entered that range (0 – 355) and pushed Play, the final notes of the music were chopped off. I noticed on YouTube that most Happy Hand Memes were 13 seconds long. At 30 frames per second, that comes to 390 frames. I entered a range of 0-388 … pushed play … and was “happy” with the result. I went to the FILE menu and chose RENDER TO AVI FILE. I chose to save it to my Desktop … and I chose the Cinepak Codec by Radius video format for a nice-looking video with good resolution and a small file size that plays well. Be sure to include MMD in your title … and the name of the Meme. I was hoping perhaps you could help me. Please see application event log or use the command-line sxstrace.exe tool for more detail. Usually models with long sleeves will have some option to “roll” the sleeves. As in Animasa models, there are movable bones (square nodes) just above the wrists. You can drag these to adjust the length of the sleeves. More advanced models may use sliders instead of bones to control the length and size of the sleeves. Adding to the answer above, you may get more visually pleasing results if you don’t just “roll” the sleeves up at the beginning of the video, but make them actually *follow* movements of model’s wrists. Look at where the wristbone is registered in FMP, see the way it moves, and adjust the sleevebone accordingly. You may consider it as an introducing exercise to the “real animation” :). There are TWO VMD files… one for Camera and one for the Model (the character)… you have to use the correct VMD for the correct purpose. When I try rendering, Cinepak Codec doesn’t show up. All I have is AVI raw, MJPEG compressor, DV video encoder, WMVideo8 encoder DMO, WMVideo9 encoder DMO, and MSScreen 9 encoder DMO. Are you using 64 bit MMD? Cinepack is a 32 bit codec and doesn’t show up there. I recommend using Ut Video for 64 bit MMD I wrote an article about it and how you can use it. I was alright, and I followed your steps as closely as I could, but when I tred selecting the camera motion, it would say no results match, and when I changed the settings to get the thing to show and I select it, MMD would say that the file wasn’t made for Polygon blah blah. I’ve tried several times already, and I really want to do this. Did you switch into “to camera” mode before applying the camera motion? I tried that, and it ended up with the same results. How about this: you open a new MMD session, then *without* doing anything else you drag and drop into it a camera motion file, a music file, a model file, and then a model motion file – in exactly this sequence. What happens after each step? I managed to get your Simple dance right earlier today. Hmm, this isn’t what supposed to happen. Must be an error so blatantly simple and obvious that it’s hard to notice. Try to describe the whole process in most primitive and detailed way, starting with “Point the mouse on MikuMikuDance.exe and double-click, see an empty MMD window”. I’m so glad I found this website because it all looks so confusing but you tell how to do it step by step really easy! Thank you so much! ^.^ I did it and it looks super cool. What are the differences between all the different rendering things? I tried the Cinepak Codec thing and it was just grey with the music, but I tried the RAW and it worked but low definition. Hmmm… RAW should look really sharp… but might play “jerky” because the file/frames are so large that they cannot play through your media-player fast enough. Try using the Microsoft Video 1 setting instead of RAW and see what you get. … let me know if you need more help: click the Ask a Question button on the homepage. Whenever I try to select a video compressor like the one mentioned or any other crashes the newest MMD, could you help me out with this? Try using the most basic video compressor choice: Microsoft Video 1… choose that one from the list rather than Raw or any of the others. Still crashes? You bet! … Thank YOU for the video! Sorry … what doesn’t work? … the Background image? Under “Background” tab, do you have “Show picture file (P)” checked? HELP!!!!!!!!!!!!!!!!! It’s not working on the newest version of MMD!!!!!!!!!!!!!!!!!!!!!!!!!!!!!!!! There’s nothing to “not work” … it works fine. Open MMD, load a model. Load the motion file from inside the Happy Hands folder. Switch to Camera mode, load the Camera Motion file, Load the WAV … Push PLAY. Away it goes! The requested URL “http://www.angelfire.com/sinlessrogue/Motion_files.html” cannot be found or is not available. Please check the spelling or try again later..” please help!